ERC’s Research Programs profile the opinions, practices, and trends that characterize energy procurement and management in the small-to-midsize business (SMB) marketplace. We also assess the practices and trends among aggregators, brokers and consultants (ABCs). 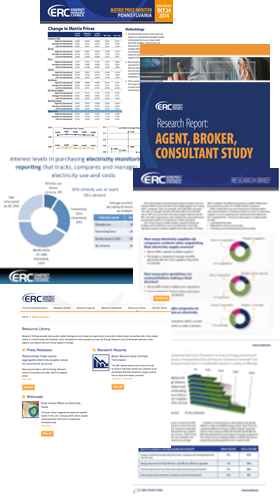 Through an ongoing series of market surveys, interviews and other research initiatives, ERC delivers high quality market intelligence. The program generates a portfolio of deliverables and program options designed to: (1) provide program sponsors with ongoing market intelligence and research insights, and (2) produce facts-based thought leadership and education for the SMB marketplace through a series of research briefs, white papers, and webinars.